I have a Moluccan Cockatoo. He will be 20 this Oct. Over the past 1-2 yrs he has become very noisy especially when I leave the room even though there are other people in the room. I have worked from home the last 11 yrs and if he hears me on a phone call or when people talk on the phone he becomes very noisy. there are times where I am in my home office and have the door closed and he just sits out in the other room and screams. We are also retiring soon and we will be traveling more so this would be another concern of leaving him alone more. So my first question is how can I stop the screaming when I leave the room as I have tried many things and second question is should I look for a new home for him since we are retiring and he will be alone more? Hi, Keith and M2, welcome to the forum! I cannot answer your question because that is a decision you need to make on your own. Moluccans have one of the loudest screams of all birds and, as all parrots, they are highly social animals so they need company 24/7/365 PLUS, because they have two breeding seasons a year, they are highly hormonal birds and VERY sensitive to the length of daylight hours so, when they are not kept at a strict solar schedule, they become overly hormonal which is, pretty much, the number one reason why they scream so much. It seems to me that he has decided you are his mate and, in his mind, his mate should never leave him alone... if, on top of this, he has not been kept at a strict solar schedule and, if by chance, he has been fed too much protein, at his age, he will be terribly overly-hormonal and, most likely, in constant pain from overgrown gonads. Mind you, I am NOT saying this is the case with your bird, I am simply putting out reasons why he could be screaming so much because, although there are species that are louder or more frequent vocalizers than others [and Lord knows cockatoos are one of them], they usually are not really that bad as long as they are kept the right way -which is NOT easy at all to do! Now, if the main problem is his screaming, we can give you husbandry guidelines that will, in time [and it will take months and months] reduce it to just a couple of vocalizations a day BUT if the main problem is that you are retiring and the bird will be alone for hours and hours or even days, then, if the bird was mine, I would rehome him because he would be terribly unhappy with this life. Having said that, you need to take into consideration that rehoming a screaming moluccan is one of the hardest things to do because finding a good home for uch a bird is super super super hard as you need to find somebody who will be home all the time, owns a house, has a quiet household [no children running around because they would over excite him], has previous experience with cockatoos [because everybody wants a big, beautiful bird but only people who have had toos in the past are truly aware of the difficulty of keeping them happy and healthy] and knows about their physiological needs [diet high in moisture and fibre, solar schedule, proper full spectrum lights, etc]. I am very sorry that you have this dilemma in your hands... I do understand what you are going through because I've had to rehome birds of my own when I realized that my home was not the best place for them. But, in all honesty and taking into consideration that I firmly believe that parrots, in general, don't belong in human homes, there are species that should have NEVER been made pets and moluccans are one of them. Thank you for your response. I appreciate all the feedback. Just to let you know what we do with him is that he is on Zupreem fruit blend for large birds. In the morning he gets 4 or 5 green grapes cut in half, a little bit of american cheese as he loves cheese but I don't overdo it, and an almond as he loves almonds. Once in a while he has a little bit of banana or apple as he loves both. He doesn't like seeds of any kind and once in a while he likes baby carrots. I don't see that it is too much protein but if you have any suggestions on this please respond. He does get covered up at night when it is time to go to bed and he is on our schedule of getting up early and going to bed between 9:30-10pm. The screaming comes in when I am in my home office although it is not all the time. He also joins in with conversations we are having or when you are on the phone. He isn't a constant screamer, thank God. I do hold him and pet him as he loves to be cuddled and petted or I go over to his cage where he lays his head on my shoulder and I pet him. I do talk to him when I am in the room. So any suggestions from what I said. I appreciate your feedback. Well, I hope you don't take this the wrong way because I know for a fact that this is 100 pct the pet industry fault and not your own but the food you are giving him is not good. The colored pellets are the worst food you can give them but, please, let me explain why I say this. 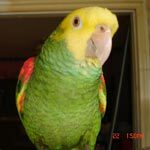 I've been doing research on parrots natural diets for over 20 years and have long ago reached the conclusion that pellets are not and never will be the best dietary option for them. I'll just give you a small list of what I find wrong with them but, if you want, I can elaborate on each and every point. Pellets are too dry [max moisture is 10 pct while parrots eat a natural diet of 85 to 95 pct moisture and this is made worse by the fact that they are crepuscular feeders], all but one brand are made with inferior ingredients [animal feed instead of human grade], all but one brand are made with soy [estrogenic and goitrogenic side effects], they are 'dead' food [no enzymes, no phytonutrients], they don't have any natural vitamins [they are all man-made which we now know are not anywhere as good as natural ones derived from food] and the ones you are feeding have artificial colors and flavorings [and the color red has been found to cause hyperactivity in lab animals]. Cockatoos are EXCELLENT eaters of produce - so much so that they are the only species that I have observed going for leafy greens first - and they all love fruits and veggies with a passion. Now, before you tell me that you have tried but that it did not work out because he doesn't like produce, let me tell you that all my birds came from somebody else and it's rare that I get one whose previous owner says it's a good eater as most of them came to me as either pellet or seed junkies and eating a very small range of 'other stuff' but they are all good eaters now. I'll give you one single example. I got a quaker a few weeks ago and I was told she was not a good eater but, so far, she has eaten apples, pears, oranges, bananas, blackberries, blueberries, cantaloupe, mango, grapes, figs, tomatoes, corn on the cob, white hominy, carrots, peas, yellow/orange/red/green peppers, green beans, sweet potato, butternut squash, broccoli, sugar snaps, yellow zucchini [had no luck with the green one but it'll happen], dandelion greens, red swiss chard and romaine [but only the stalks, not the actual leaves] - and I am sure I am forgetting a couple of things. It's a matter of timing, presentation and making them want what you are eating. Now, I can't tell you what to feed your bird because that is your decision but I will tell you what my cockatoo eats on a daily basis. For breakfast, he gets about two VERY heaping tablespoons of gloop [they get a different flavor every morning, alternating fruity with spicy] accompanied by a fruit, a veggie and a green [a different one every day]. This morning, he got gloop flavored with ginger, a slice about 1/6 of a large orange, a small red pepper [the miniature ones] and two large 'leaves' of dandelion green. For dinner, he will get his usual mix of nuts and some small seeds [I use a cockatiel mix that has very little sunflower seeds and add human grade nuts to it for the large species -the mix varies but it's always three or four different kinds, right now they have english walnuts, almonds, cashews and pistachios but they also get pecans, macadamias, filberts and brazil nuts]. He also gets a multivitamin/mineral supplement twice a week as well as other stuff like ACV with the mother and aloe vera juice from the inner leaf mixed with his water and liver/kidney cleansers and tonics mixed with his gloop [he is 28 years old and did not have a good diet before coming to me]. The other problem is the light schedule you have him under, it's a human one and not one for birds. Birds are photoperiodic - a large word that means their endocrine system [the one that 'tells' their bodies if it's time to breed, to molt, to sleep, etc] is governed by light [photo meaning light and periodic meaning season]. Birds have photoreceptors [cells that 'sense' light] deep in their brains [mammals only have them in their eyes] which are 'activated' by the special light that happens at dawn and dusk [it's the special spectrum distribution that happens when the light refracts differently as it hits the atmosphere at a steep angle when the sun is rising or setting] and their bodies 'count' the number of hours in between the two twilight episodes [think of it as a stop watch that gets turned on at dawn and off at dusk]. The different number of hours tells their bodies what 'season' it is, whether it's time to start producing sexual hormones or to stop, whether it's time to molt or not, etc. [you can do more in-depth research on this subject by putting avian photoperiodism, avian endocrine system and avian reproductive system on your search engine]. When you keep a bird at a human light schedule and free-feed it protein food [filling up a bowl in the morning and leaving it there all day long], you are making their bodies believe it's breeding season all the time which NEVER happens in the wild. Now, the problem with this is actually more complicated than it sounds because the poor bird doesn't only end up being terribly aroused all the time and with no relief but also in physical discomfort and even chronic pain from gonads that did not stop growing after some months and became dormant and shrunk in size at the end of the breeding season but which continue to grow becoming overly large and, sometimes, even pushing other internal organs out of the way. This unnatural situation [it never happens in the wild] causes both psychological and physical stress - and it makes them scream, bite, pluck, etc. One could say that, generally speaking, the greatest majority of 'undesirable behaviors' in parrots are a consequence of them being overly hormonal... You also have to be careful with the petting because cockatoos tend to like 'heavy' petting like hugs and tickles under their wings but one should only touch their head, neck and cheeks because only a mate touches any other part of a parrot's body as, as far as they are concerned, they are all erogenous zones and good for foreplay. I think that I've given you enough to think about for now so, please, let me know if you need further clarification on anything that I mentioned here or if you have specific questions and we will take it from there. I really do appreciate you taking the time to post such an indepth response. Your knowledge is invaluable. One question I have is after you feed them in the morning is there anything else in their feed bowl during the day and how many times a day do you feed them? Another question is should I be covering him up at all at night? what is the gloop mixture you give your bird and what multivitamins? I am going to make some changes immediately and start phasing in some of things that you have suggested. Again i appreciate all of this and so glad I found this forum. There are many gloop recipes in the forum. Key "gloop" in the search to bring them all up. I soften grain over night then add frozen vegies to it. In the wild they would eat as much as they could in the morning, pick at food all day then eat as much as possible to hold them overnight since they cannot see in the dark. My cockatiels get fine chopped fruit and veg except for a celery stalk which ends up anywhere but where I left it. The larger parrots want to pick up their food so I cut Amazon food in chunks. I give them more fruit and veg than they can eat and they pick at it al day. Since seed to them is like candy, I give them seed in the evening and they will tank up. Since I control the high protein seed, I let them pick a pistachio out of the container to hold them until I feed everything else. In the evening they get an almond in the shell. I let them pick their own. Some times it is pick up and put down until they pick the right one. My Amazons eat more of their fruit and veg with the seed supper so I do not pick it up. I also leave the freshest of the veg for Rainbow who will eat in the dark. I am stricked with their food and light. Parrots, as all prey animals, are crepuscular feeders. This means that their brains are hardwired to eat and drink at dawn and dusk [because ten pct of the predators vision is lost during these times so it's safer for them to go to ground during these times] so that's when I feed mine: twice a day, breakfast a bit after dawn [to get them good and hungry] and dinner when the sun is setting but with enough time leftover for them to 'wind down' and get to their roosting perch with enough light for them to see. I always give them plenty of gloop and produce so there is always quite a bit of leftover [which, in my case, doesn't go to waste because I collect it and feed it to the street pigeons]. I'll tell you what my routine is to give you an example. At this time of the year [it changes because their schedule -and, therefore, also my own- changes with the seasons], I get up at 5:15 to 5:30 am and I pull up the blinds, uncover their cages [more on covering the cage below] and open the doors so they can come out at around 5:30 to 5:45 am [it also depends on how bright or how grey the day is]. I give them their produce while I clean their cages at around 6:15 to 6:30 am and their gloop at around 7 or 7:30 and I turn on the overhead full spectrum lights a bit later. I put out plenty of gloop and large portions of produce for them because it doesn't matter how much they eat of these things, they still do not get fat. When you feed pellets, they tend to overeat because they only feel full when their crops are [think of sawdust, if it's dried and compressed, you end up with a small pellet, but take that same pellet and put it in water and it will grow to four or five times its size, right? Well, it's the same thing with parrot pellets. Parrots have no saliva in their beaks and a very limited amount of it goes into their crop so the pellets actually remain dry [and 'shrunken'] until they get to their proventriculus [their first 'stomach'] so they end up eating more pellets than they actually need. But gloop is made out of cooked whole grains [think how much rice 'grows' when you cook it] and chopped frozen veggies so it's more water than anything else as well as very high in fibre - the two things that make you feel 'full' with very little calories. Liz is correct, there are several recipes of gloop but, as a general description, it's a dish made out of cooked whole grains, pulses and chopped frozen veggies [because frozen is more nutritious than fresh]. I use kamut, spelt, hulled -not pearled- barley, oat groats, some type of wheat [could be hard red winter, could be soft white spring, could be farro], quinoa or millet [this depends on the season because quinoa is higher in protein than millet], red and/or black rice, small white beans [I ONLY use white beans because they are the lowest in the bad lectin that all beans have] and lentils [I use the round, black ones but the regular brown ones are good, too] - these are cooked al dente [so the outside is soft but the inside is still hard and they retain their shape and do not stick to one another] and allow to cool. Once they are cool, I mix the beans [I use a small amount of beans] and the frozen veggies [which I mix still frozen so as to retain the maximum nutrition]. The veggies I always use are: chopped broccoli [I buy it already chopped in bags from the frozen section], corn, peas, carrots, butternut squash [comes already cubed], white hominy [I get cans of this and rinse them very thoroughly under running water] and sweet potato chunks [I either bake them in the winter or nuke them in the potato express bag in the summer] but I, sometimes, add other stuff... it could be beets, it could be chopped green beans but, usually, it's artichoke hearts [which you can also get frozen, add whole and, once they thaw, you can chop up right before you serve] because they are so good for their livers [always a problem with pet parrots]. This makes what I call the 'basic' recipe which gets split into daily portions into baggies and frozen. I take out a baggie three days prior and leave it in the fridge to thaw slowly but, if you forget, you can always defrost it in the microwave. Then, first thing in the morning, I take the thawed baggie out of the fridge and leave it outside to get it to room temperature [but, in the winter, I make it a bit warm in the microwave] and I 'doctor' it with different flavors so they don't get bored eating the same identical thing every day. I use spices and other stuff for this - things like raisins, currants, organic and naturally dried apple or pineapple, unsweetened coconut, etc. and cinnamon [but make sure it's the real one, the one from Ceylon and don't use a lot], ginger, oregano, garlic, chili powder, white and black pepper, rosemary, thyme, nutmeg, allspice, jalapenos, habaneros, chile de arbol, etc. I get all my supplies for the gloop from the regular supermarket organic and health food section but I still have to go to Whole Foods for the black lentils and rices. Now, one more thing that I remembered last night I had not covered: the cheese you give him. I know that you will read many times that people give their parrots things like cheese, eggs and yogurt - sheesh, even avian vets tell their clients it's OK to feed them these things but that's because avian vets don't really study parrot natural diets. The thing is that, contrary to popular belief, parrots are not omnivorous. With the exception of two or possibly three [more study is required] species of parrots, they are all classified as herbivores by ornithologists. Now, don't misunderstand me, a parrot is not going to drop dead if you give him a piece of cheese or even a piece of meat but nature does not give a body what it doesn't need so herbivores don't have the right enzymes to digest animal protein -which is different from plant protein- but, most importantly, they do not have a digestive mechanism that gets rid of bad cholesterol because they never consume anything in the wild that has it. People justify feeding them meat and such saying that they eat insects in the wild, and it is true that they do -although not as many as people would like to believe- but insect protein has virtually no fat and no bad cholesterol! Cheese also has too much salt for them so, please, do discontinue the cheese breakfast, it's not doing him any favors even though I am SURE he loves it [cheese has umami flavor, a marker protein, and parrots LOVE protein and salt because, as neither is normally found in abundance in the wild but both are necessary for life, nature gave them a craving for them -same as we, humans, crave salt and fat]. Let me know if I answer your questions or if you have any other.